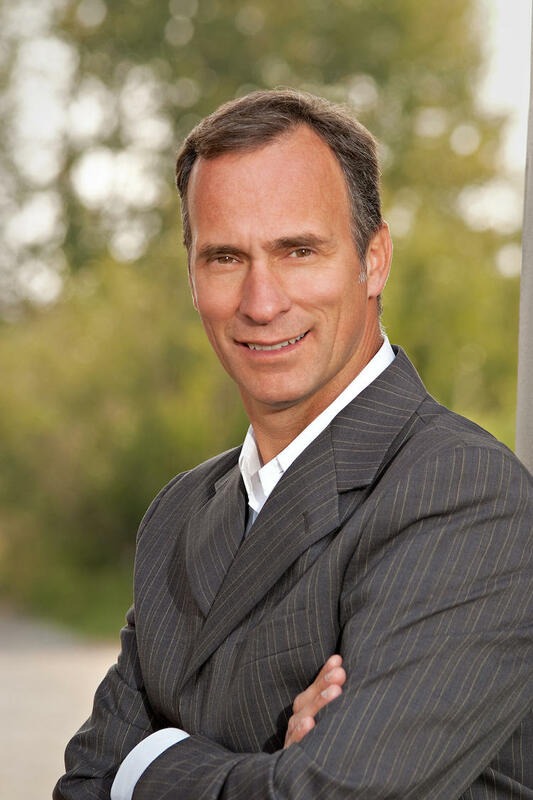 Canada’s leading Multifamily Investing expert, Pierre-Paul Turgeon. 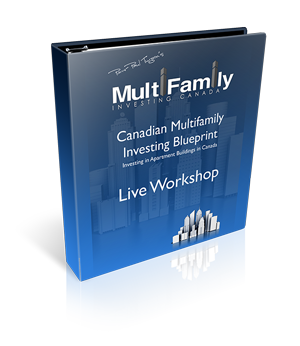 Canada’s ONLY Experiential Multifamily Investing Training Program that Teaches You Everything You Need To Become Successful Investing in Apartment Buildings. Hi, I’m Pierre-Paul Turgeon, and I created this online as a way to share my unique knowledge about Multifamily Investing in Canada. 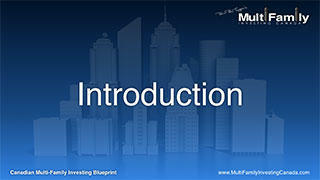 The Blueprint that forms the basis of the course is the same one that I use for every one of my successful apartment building investments, and it is based on my years of experience as a Multifamily Investing Insider – first as a CMHC Multifamily underwriter then as a successful Multifamily real-estate investor. 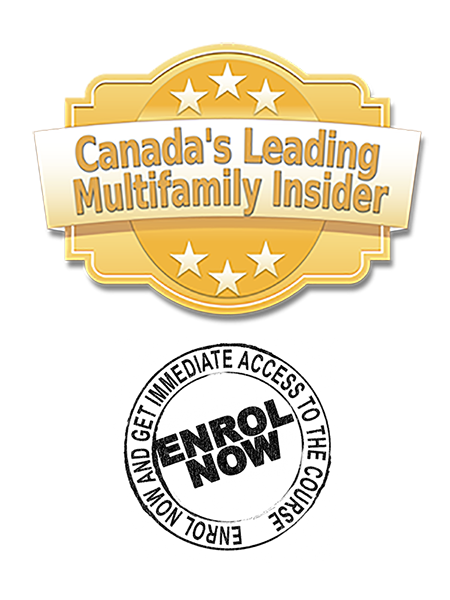 The Canadian Multifamily Investing Blueprint online course will take you step-by-step through my proven process of researching and selecting a property in a suitable market, performing your due diligence to check you are making a good investment (and to mitigate any risks), then putting together a top-notch financing application. I am considered to be Canada’s leading authority and insider when it comes to investing in apartment buildings because of my unique perspective on this type of investment. I am a former CMHC multi-family underwriter and a full time multi-family investor with a portfolio of 160 doors valued in excess of $22M. As a former CMHC apartment building underwriter, I analyzed hundreds of apartment deals in three provinces and three territories. I have probably analyzed more apartment buildings than most of the largest landlords in the country. Not only am I familiar with the front end of buying apartment buildings, I am also very knowledgeable about the back-end of this business (that is when apartment deals go sour and investors default on their loan), as I also managed the default management department in CMHC’s Prairie office. This wealth of knowledge and experience enables me to invest in apartments buildings strategically to ensure a sound return for my investors with low risks. This means that I have unparalleled knowledge of what makes a sound investment and what goes into a winning financing application – from the research you need to do up front, right through to the data you need to submit to convince the lender that you are a sound bet for their financing. All of this is covered in the Canadian Multifamily Blueprint Course, where you get to learn direct from me what works and why. In the Online Course, step-by step videos let you learn at your own pace. Also you get to review the material as many times as you need to. The material will be there to support you if you are doing a deal today or in a year’s time. 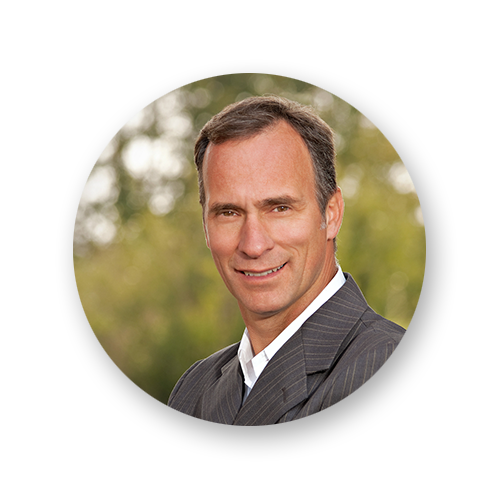 Here’s a testimonial from Don Campbell, founding partner of REIN (the Real Estate Investing Network). 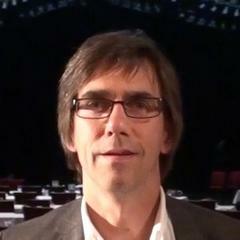 Don is the author of the best-selling Canadian real estate book Real Estate Investing in Canada. Published in May 2005, it has become the all-time best-selling real estate book in Canadian history. He has been featured on every national media network across Canada (including BNN, CTV, Globe and Mail and National Post), and is widely regarded as the No. 1 Real Estate investing Expert in Canada. "As soon as Pierre-Paul Turgeon stepped out from behind the curtain at CMHC, he started to make a difference. What he brought with him was a level of experience of seeing – in the ‘default’ world – mistakes that people had made, so that you don’t have to make them. On the other side, when he was doing the underwriting at CMHC, he learned how to get the best financing deals together. You combine those two and you understand, quite clearly, why his workshop is so incredibly powerful. An investor, a finance expert, and he knows the mistakes that others have made so you don’t make them. Way to go, Pierre!" Let’s Get Right To It – What’s In The Training? The event and the online course is split into 3 sections that reflect the sequence I follow for every one of my deals: Planning and Selection, Due Diligence, and Financing. In this section you will lay the foundation for a successful investment by learning how to perform effective research and select a market and a property that will make a sound investment. 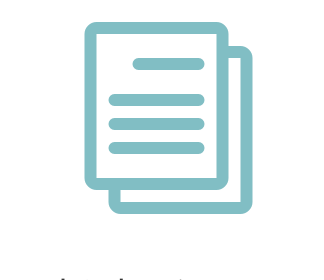 In this section, you will collect and evaluate all the data and documents necessary to create a successful financing application. In this section you will bring together all of the data and documents that you have collected and produce a top-notch financing application. The key difference with this live event is the experiential training provided. I use a workshop format to deliver the material, to make sure you have a chance to work on examples yourself. This helps to make the information more “real”. 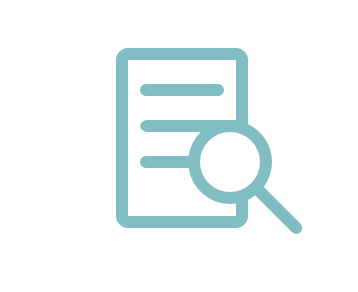 Each concept presented is demonstrated with a worked example from a property I own – you will see all the research, due diligence and financing figures I collected, and walk through the whole process with me. Another important part of this workshop format is your opportunity to ask questions and discuss each topic with myself and other industry experts. The number of attendees at the Workshops is kept intentionally low to ensure maximum participation. I have arranged for a professional property inspector to take you on a full property Inspection (one of the critical elements of your Due Diligence of any deal) at one of my own apartment buildings. You will see, first hand, how to carry out your own first-pass property inspection (which can save you thousands of dollars), and also the kinds of things a professional inspector would be looking for when assessing a property. 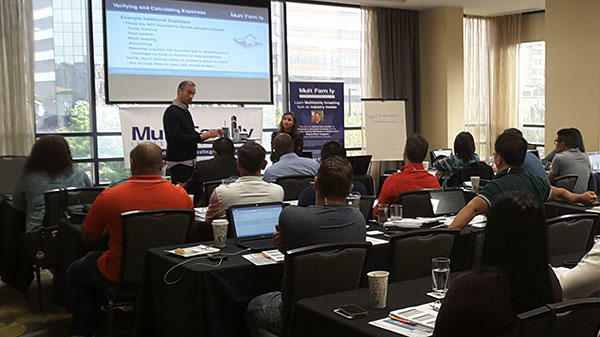 In addition to my own teaching, I have invited a number of subject-matter experts from the various professions connected to the world of Multi-Family Investing. 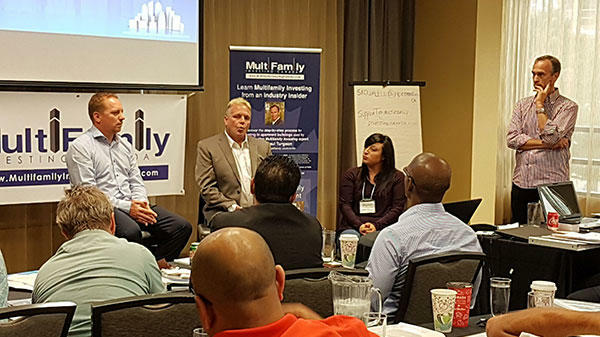 These experts all work within the local area around the Live Workshops, so they have intimate knowledge of everything you need to know about Multi-Family Investing in that area. You will have an opportunity to learn from these experts and, more importantly, you will be able to kick-start your network of MF professionals. 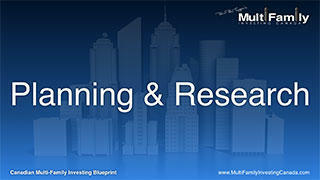 Below is an outline of my Canadian Multifamily Investing Blueprint. When you attend the live event, this is the material that we will cover together. 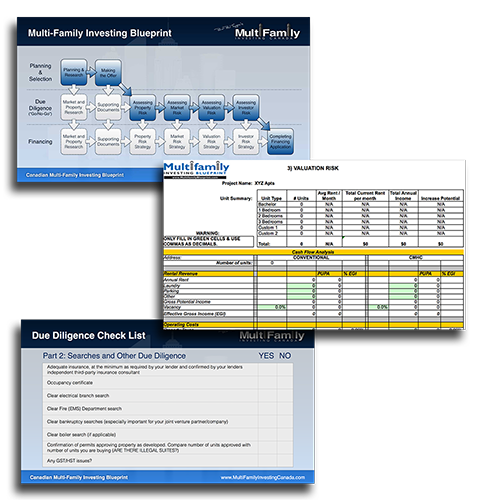 By working through this Blueprint you will have my own step-by-step process to follow each time you invest in a Multifamily Property. 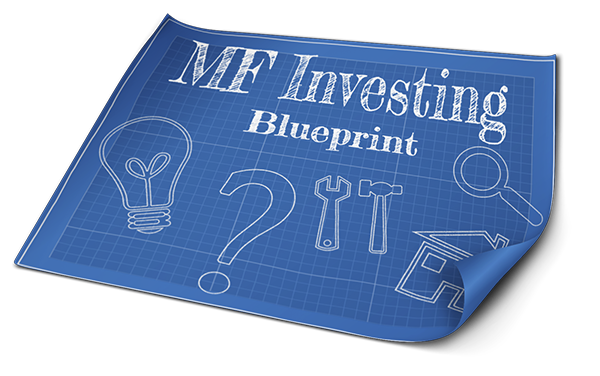 The Blueprint is designed to walk you through the entire process of investing in a Multifamily property, from research and selection, through making an offer and due diligence on the investment. 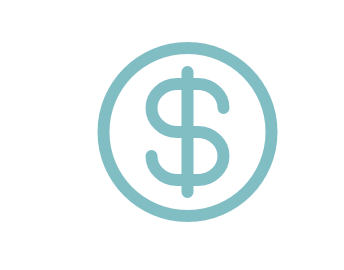 All through the process, you are guided as to what data to gather to enable you to put to gather a rockstar financing application. In this module, I cover the basic principles behind Multifamily Investing, and the mindset you need to have to succeed. The goal is to prepare you for the work ahead, and to make sure that you understand the overall strategy behind the Blueprint, so that you have the best chance of success. This module is the first, and arguably the most important module in the whole course. This is where I walk you through some of the fundamental decisions you need to make before embarking on your Multifamily Investing journey. These decisions will streamline the work you do throughout the process, making you more efficient, and making sure you appear professional. I also walk you through the various steps for identifying potential markets to invest in, and obtaining listings of properties for sale in that market that meet your criteria. In this module, you will learn about the important aspects of making an offer, starting with the most important point: your realtor will do the hard work for you! I cover the main elements of an offer, what to look out for when preparing your own offers, and how to prepare for the next phase of the process once your offer is accepted. In this module, the first of the Due Diligence Modules, I talk about the most import piece of Due Diligence: Property Risk. If there are any issues with the property itself, it’s vital to discover them as soon as possible so that you can either put a plan in place to mitigate the issues or, in the worst case, walk away from the deal. This module, the second in the due diligence process, builds on the work we did in the planning module, where we focused on the macro aspects of the market. Here we look at the market from the micro perspective as it relates specifically to the property that you have under contract (accepted offer for). We compare the property’s performance (in terms of average vacancies and current rental charges) to average comparable properties in the market place. Our goal is to determine if there is a discrepancy that needs to be addressed, or if there is an up-side whereby the value of the property can be increased (by increasing rents). For obvious reasons, this is the most content-intensive module in the due diligence process. In this module we get into number crunching to determine the approximate value of the property using data obtained from the vendor and our market research to see if it’s in line with recent sales of comparable properties in the market. 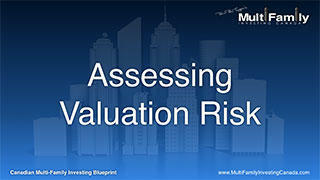 We review the main valuation approaches and the concept of cap rates and other key financial indicators you need to know. 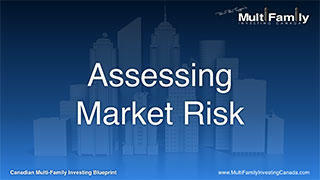 The goal is to determine what financing may be obtained based on the chosen financing strategy. In this module, the last one in the due diligence process, we look what is required from the investor/borrower to qualify for financing, and check that everything is in order. Areas covered include: competence, capacity, net personal worth, personal guarantees and types of legal ownership structures for properties. In this module, we look at the two sources of financing available – conventional and CMHC-insured financing – and discuss the pros and cons of each type of financing and their respective rules and impact on profit. We also analyze different financing strategies and the various circumstances in which they can be applied using actual case studies. We also show you how to bring together all of the work from the previous modules into a top-notch financing application that your lender and/or CMHC will love you for it (and possibly save you thousands of dollars in the process). Over the years I’ve been investing in Multifamily properties, I’ve created a bunch of extra tools, checklists and materials to support my own investing. 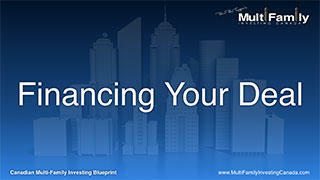 As part of the workshop, I’ll be providing you with those same tools to support your own Multifamily Investing journey. For example, there’s the Due Diligence Checklist, to help you make sure you have all of the documents and data you need before starting your due diligence checks, and the Multifamily Investing Spreadsheet, to take away the heavy lifting from the number-crunching involved. Every attendee of the live event receives their own printed copy of all the slides from my presentations for the Workshop. These notes are yours to take away, and there is plenty of space for your to add your own comments and thoughts to make them even more valuable. 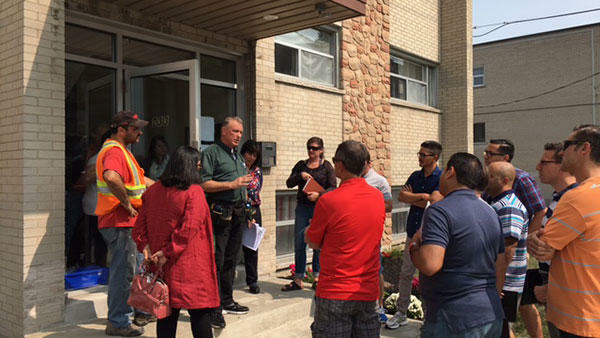 Between the Live Workshop and Online Training you will have become a professional and know absolutely everything to become very successful with investing in Canadian apartment buildings. *GST added at checkout. Prices subject to change without notice. You have a full 30 days to try out the online training and dive into all the materials. If you decide this course isn’t for you, then let me know and I’ll refund your money in full… no questions asked (although I would appreciate you letting me know why, just so I can improve the course). 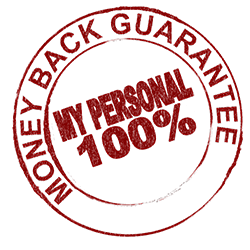 If - by the end of the first day of the live training - you decide this course isn't for you, let me know and you will receive a full refund for the live portion of the training. Below are some testimonials from students who attended my recent Live Workshop in Hamilton ON. "You get the tricks, you find out exactly what to do and what not to do, and everything that an underwriter is going to be thinking. You’re going to be thinking like a lender. Also, the people here are great… you meet some great people and you can learn from them. I would recommend this training to anyone who is at that position to step up their game. " "This course is worth it’s weight in gold. It’s a small investment for potentially absolutely enormous returns. I can’t speak highly enough about this." "It’s been an awesome weekend of learning. With Pierre-Paul’s help I have more confidence than I need. I would highly recommend if you are looking at investing in Multi-Family property to take this course." When will I get access to the course material? The next intake of student is happening right now. Enrolment can take up to 24 hours, but after that you will have access to the first module. Further modules will be released on a weekly basis, to enable you to absorb the material. What is the duration and time commitment required for the course? The course is content-heavy, as Multifamily Investing contains many moving parts. However, the content is broken down into small lessons of 5 to 10 minutes each, and you can watch them at your leisure. I imagine that you could theoretically view the majority of the core content in a couple of days, maybe less. But keep in mind that implementing what you learn on the course will undoubtedly take you much more time! What if I have a question that is not answered in the course material? The course is comprehensive, and contains everything I think you need to have the best chance of making a successful Multifamily Investment. However, every lesson has a Comments section where you can ask specific questions about the material. I will be reviewing these questions on a regular basis and responding personally. This way, everyone can benefit from the knowledge. If necessary, I will create additional content and add it to the course if I believe that it would add value to everyone. 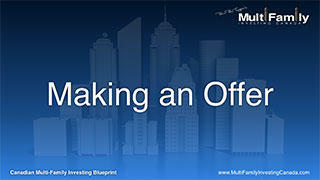 Do I need lots of capital to get started in Multifamily Investing? No. In fact, my method is based on raising the capital required for the deal from outside investors. What’s better, you can use the same research and information that you will use to make your financing application to attract investors. Is Multifamily Investing a get-rich-quick opportunity? No. Like any other property investment, there are opportunities to make a profit quickly. But the real attraction of Multifamily investing is that it’s a solid long-term investment strategy. I'm new to Multifamily Investing - help! Don’t worry! This course starts from the very beginning, covering the basic information you need to succeed in Multifamily Investing (like the Mindset you need to have, the ways you can make a profit, and the pitfalls you can easily avoid if you know what to do). I’ve put everything I know into this course to make it the most comprehensive guide to Multifamily Investing that I can, so you can learn from my years of experience and fast-track your first steps in Multifamily Investing. Pierre-Paul is Canada’s leading authority and insider when it comes to investing in apartment buildingsbecause of his unique perspective on this type of investment. He is a former CMHC multi-family underwriter and a full time multi-family investor with a portfolio of 160 doors valued in excess of $22M. As a former CMHC apartment building underwriter, he has analyzed hundreds of apartment deals in three provinces and three territories. He has analyzed more apartment buildings than most of the largest landlords in the country. Not only is he familiar with the front end of buying apartment buildings, he is also very knowledgeable about the back-end of this business (that is, when apartment deals go sour and investors default on their loan), as he also managed the default management department in CMHC’s Prairie office. This wealth of knowledge and experience enables Pierre-Paul to invest in apartments buildings strategically to ensure a sound return for his investors with low risks. Pierre-Paul has won numerous awards, including Multi-Family Investor of the Year and Top Player of the Year with the Real Estate Investment Network (REIN), and Service Provider of the Year (2012) by CREW for his Multi-Family Training Program. He is a national speaker and trainer on the subject of multi-family investing. Enter your full name and email below to be notified when the Edmonton Event becomes available for enrollment.